UTSA football head coach Frank Wilson fired offensive coordinator Frank Scelfo before bowl game announcements. Wide receivers coach Jeff Kastl will call the plays if UTSA is awarded a bid next Sunday. UTSA football fans’ outsized expectations for the 2017 season led to great disappointment and frustration following the ‘Runners widest-margin loss to the Louisiana Tech Bulldogs. San Antonio-Express News reported a victory against Louisiana Tech would have guaranteed a bowl bid, but Wilson expressed confidence UTSA’s 6-5 record will be adequate. Nonetheless, Scelfo will not be included in the program’s second bowl appearance. Much of the fans frustration with UTSA’s season downturn was directed to Scelfo. His play-calling was called into question and often blamed for many losses–particularly the red zone opportunities in the final minutes. Scelfo at times was even charged with wasting Quarterback Dalton Sturm’s final season. Outside and inside views of a football program often conflict. UTSA football players opinion of Scelfo did not match the fans’ disapproval. Sturm and other players tweeted their deep gratitude and admiration for their former coach following the announcement. Coaches are held to a simple standard — produce results or get fired, but fans smearing Scelfo on social media didn’t sit well with Sturm. “Funny to see people who know absolutely nothing about college football think they are suddenly masterminds,” Sturm tweeted in response to criticism of Scelfo. Scelfo held his position at UTSA for two years. Prior to that, he was an NFL quarterback’s coach for the Jacksonville Jaguars. His mentorship experience impacted Sturm and players alike. 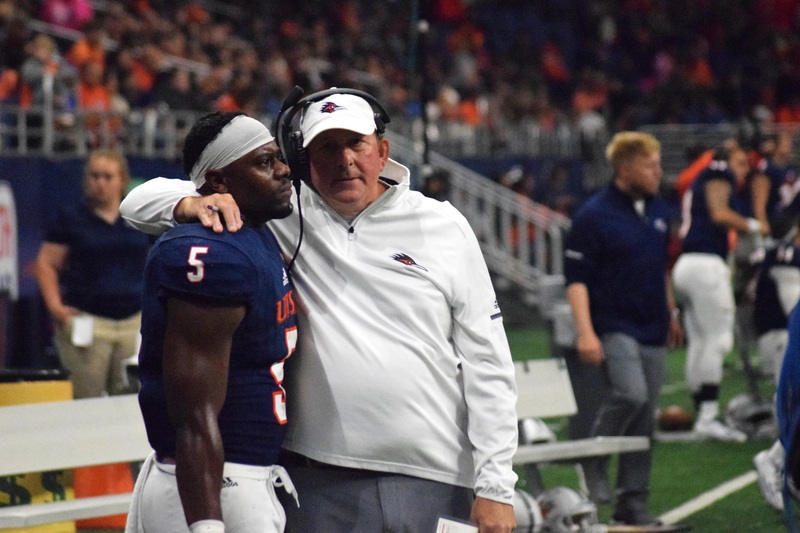 The high praise shared by UTSA players in contrast to the fan’s criticism sheds light on how the players view who is at fault for their lackluster offensive performance. UTSA did not score an offensive touchdown in the last two games. Scelfo departed on friendly terms. He praised UTSA’s passion and described his time as a Roadrunner as an enjoyable stop in his coaching career. With Scelfo gone, the ‘Runners next mission is to replace him with an offensive coordinator who fits the UTSA football program’s direction.